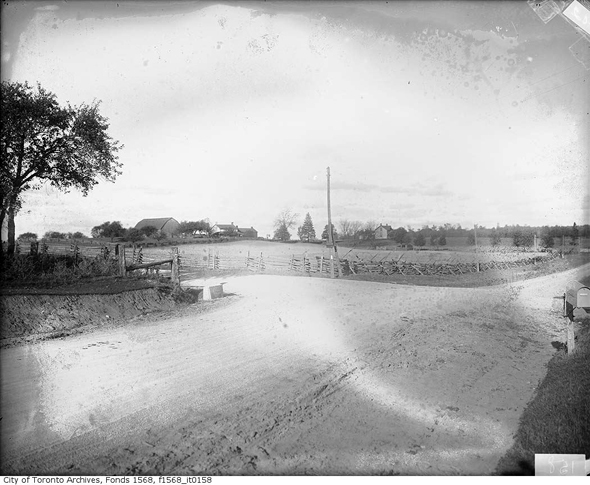 It's not a matter of common knowledge in Toronto that the majority of the the typical 1950s suburban communities that engulf the city were originally farming villages and hamlets, which were usually centred around crossroads, and had their own distinctive character as points of sparse rural settlement. Places like Scarborough, for example, were townships that consisted of such settlements, divided by numerous farm fields and dirt routes, and dotted with the occasional general store or tavern. I have previously devoted this column to writing about such places and New Toronto, Don Mills, and Agincourt. Today, I'd like to take a look at Brockton and Ellesmere, two former villages that the city and the postwar sprawl have claimed respectively. According to Ron Brown's Toronto's Lost Villages, this village was originally known as Lippincott and centred around Dundas Street West and Lansdowne Avenue. 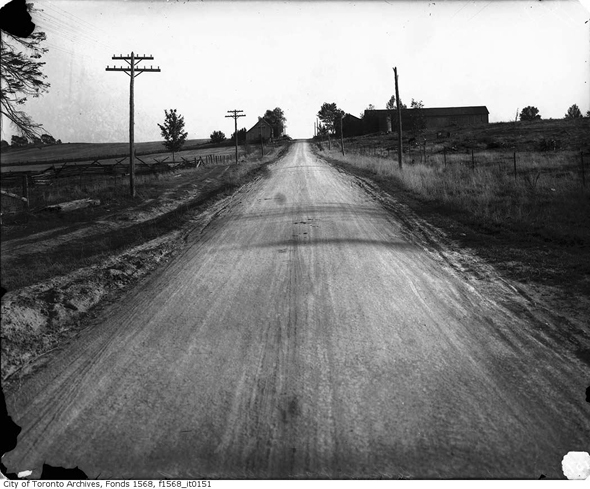 Dundas was a toll road, and the proceeds derived from the money charged to the travellers went to the maintenance of the road. Three taverns were located east of the toll gate, which were nicknamed "Appii Forum": Collard's Hotel, Joe Church's Brown Bear and the Queen Street Hotel. This was the point of rest for the travellers and their horses, who were heading to Hamilton. The area was later named after Sir Isaac Brock, a hero of the War of 1812. In the 1840s, an influx of Irish immigrants escaping to the potato famines settled in substantial numbers in the area, where many of them found work. Dundas and Brockton Avenue (now Brock) became the new centre of the village. A series of workers' cabins built on Brock were colloquially named "Stoney Butler Village." By 1881, a town hall was built at the corner of the intersection. 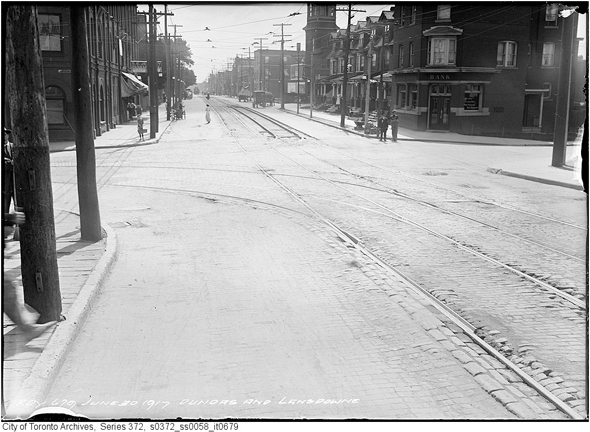 Streetcar service on Dundas was extended to Dufferin Street in 1882, which at the time represented the eastern boundary of the rural community. At the time, the population of the village grew to seven hundred and fifty, and it became incorporated as a town, which was later annexed by Toronto in 1885. 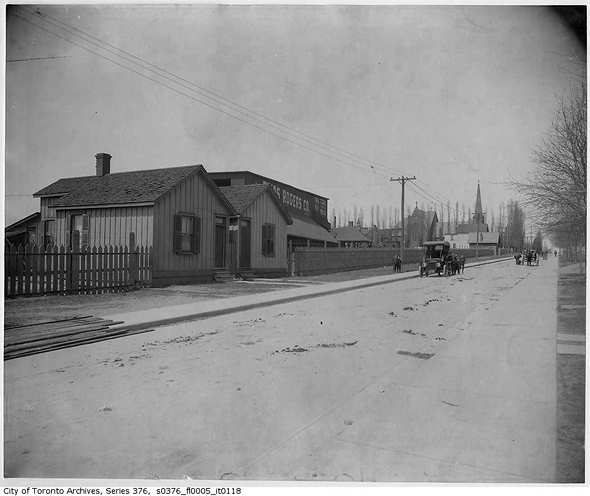 Around 1893, electrical streetcar service began to operate on Dundas Street, which dramatically contributed to the intensification of the community. 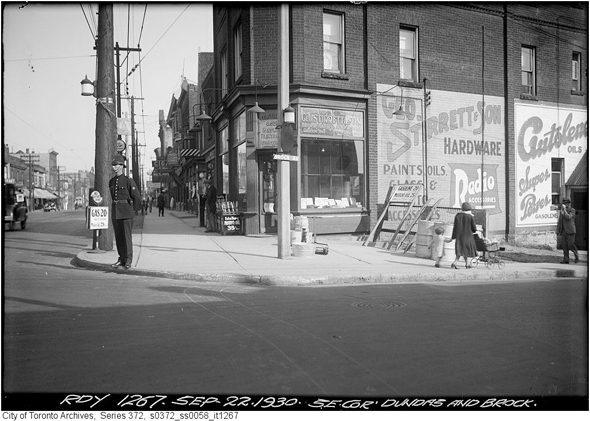 A variety of new stores opened on Dundas, which began catering to the thriving community. The farms in the vicinity were sold and the former fields were subdivided into streets and housing lots, with the effect that Brockton became a streetcar suburb by the end of the nineteenth century. Dundas still retains the typical characteristics of other streetcar suburbs, such as New Toronto, with storefronts on the ground floor and living spaces on the top floors of the structures on both sides of the street. The former town hall still stands at 1617 Dundas Street West, although now it is a plumbing store whose exterior needs a fresh layer of paint. Or two. Unlike Ellesmere, Brockton has retained its individual character, owning this mostly due to the fact that it was largely developed prior to the suburban onslaught of the 1950s. The name of the former village is not even applied to any neighbourhood is Scarborough, as was the case with Agincourt, for example. It only survives in the name of Ellesmere Road, a typical arterial street running east and west in northwest part of the suburb. Ellesmere was a thriving farm village that centred around the crossroads of Kennedy and Ellesmere Roads. When Archie Glendenning built a general store in the area in 1820, it was slowly coming to life as a farm community, which grew slowly during the first half of the nineteenth century. By 1853, when Glendenning was granted permission to open a post office, which he operated from his stone farm house, the village boasted of two blacksmiths, two general stores, carpenters, jewellers, shoemakers, butcher and a wagon factory. The Forfairs (sometimes spelled "Forfars") were a prominent family in the area, who owned a number of the above mentioned businesses. At the time, local directories estimated that about one hundred individuals inhabited the village. In the 1960s and the 1970s, Kennedy Road began to be transformed into a commercial district, spelling the end of Ellesmere as a village, which, like other formerly rural corners of Scarborough, was not able to withhold the tide of the urban sprawl that began to gradually take over the township, starting in the early 1950s. In 1980, the historic Glendenning structures were demolished to make way for a bank. All other rural remnants are long gone, and have been replaced by what Brown refers to as "one of Scarborough's more unsightly examples of unplanned urban sprawl," and I couldn't agree more.